Debate, reason and argue your way to your faction's victory in The Trials of Idavare, an easy to learn but hard to master party game! Every player draws a secret skill and a secret faction card. Darn it, here comes a Werewolf Guard! Players with Human faction cards win by killing every Werewolf. Werewolves: Just eat all Human players! For over eight years, we have been playing Mafia-like games, such as The Werewolves of Miller's Hollow – which is a great game. Alas, with time, techniques emerged that sent werewolves to the grave rather unspectacularly. In their struggle against the revealing and combining of special powers, werewolves were often forced to risk their cover, their only way to survival. (See the section near the bottom of this page for some thoughts on unfortunate dynamics.) As the pile of lupine corpses grew, we felt that something had to change, and sought a way to revive the werewolves' defining powers of stealth and deception. Players debate, argue and reason to gain other players' trust. Keep in mind: There's safety in numbers! What began as a minor idea turned into The Trials of Idavare. Its rules are designed to allow variety in the game, but not at the cost of the players' chances to deceive or reason. We have split characters into factions and skills, so that a display of ability is no warrantor of trust. The available skills aim to convince with quality, rather than quantity. The Trials of Idavare is a game that gives power to your understanding of the other players, your senses, your acting and ability to convince others. A game to bring out the battle of wits that can turn an evening into an adventure. Cupid disguises himself as a human, yet occasionally "speeds up" relationships to bring love to Idavare. Yes. We've first started playing The Trials of Idavare four years ago. We've played it with eight players, we've played it with 23 players. We've played it with newbies and with veterans and international friends (mostly New Zealanders – but we love every country :) ). Throughout the past years, we've refined it and received a lot of positive feedback. Now, we are confident to present a really great game to you, the Kickstarter community! If you like having debates for days to come after a round of The Trials of Idavare, this is definitively a game for you! The Hunter is the only villager in possession of a firearm: his beloved, single-barreled hunting rifle Mathilda! We've played with very plain prototypes up until now. You can download them further below! But none of us is an artist, and we'd like to be able to present some eye candy to you. That's why we work together with the amazing artist Dichrome. She will do the artwork for The Trials of Idavare and has done the character illustrations you see on this page. By debuting on Kickstarter, we want to share a game we have developed and came to love, as well as seek some financial support in order to pay our artist properly! We ask for 4000 EUR, which corresponds to about 100 copies plus Kickstarter fees plus shipping, since production would be too expensive for fewer copies of the game. The fine line between life and death has fascinated the Witch of Idavare ever since she was a little girl. One copy of The Trials of Idavare lets you play with up to 27 players, plus one game master, so it is ideal for parties. The sweet spot is around 13–16 players, but additional cards also allow you to experiment with different skill card combinations! All cards are, of course, in English! An awesome full-color box that is big enough to contain potential stretch goal rewards! So, why does the game cost 23 EUR? First of all, everything is printed on high quality materials, which raises the base price a little – but it is worth it. All cards will last for many, many rounds of intense Trial'ing. That makes 23 EUR per copy + shipping&packaging, covering all basic costs. If you want to help us cope with Kickstarter fees and pay our artist, we certainly would appreciate a little extra – but don't feel obliged! Should we have more backers than that, production costs will decrease. That's when stretch goals kick in! Currently, the localization candidate is German, and the runner up is French! Want to test The Trials of Idavare? We provide you with a plain, English, printable version of game instructions and cards – the same we've used for years. Just print, cut out and play! Here you can watch episodes from a marvelous game of The Trials of Idavare we played the other day (real gameplay! ;-)). Multiple copies: If you would like to get additional copies of the game or T-Shirts (see below), please increase your pledge by 23 Euro for each game and 20 Euro for each T-Shirt. We will ask you how to spend these additional funds before production. The Mask: Always wanted to surprise your friends or run around at night looking like a werewolf? That is no problem with the werewolf mask we used in the film! Will also keep your face warm (very warm). A silk-screen printed shirt with metallic silver paint accents to show the world that there's more to a book than its cover! Unlike thermal printing, a silk-screen print will last for many wash cycles. We'll ask you to choose from black or blue women's or men's shirts of multiple sizes! Featuring the most common statement in the game! Click to enlarge. The Ars Versipellis: A limited, super-high-quality book with black leather binding, silver metal book corners and silver embossings on the front – containing artwork without distracting text, strategy discussions and advanced playing techniques that we've collected and discussed in the past years. Also, there's a chapter about ways to determine a score for player strength. We like to quantify stuff. ;) This gem of a book is limited (There will be a maximum of 50) - and each will carry its unique serial number. For the highest reward tier, we'll request a picture of you – and have a farmer digitally painted based on your appearance that will be included in the regular game! You also get to choose a quote from our collection of The Trials of Idavare-suitable quotes to accompany your farmer card. Additionally, you receive a high-quality A4 poster print of your farmer! Phew – you managed to reach the bottom and you are still interested. Great! This section will only make sense if you know The Werewolves of Miller's Hollow though. So, what are the “severe weaknesses” of The Werewolves of Miller's Hollow we were talking about? Any special characters that have been disclosed cannot be werewolves, and players can often identify too many relevant roles beyond reasonable doubt. This is especially problematic in small rounds or at a later stage in the game, when the couple is dead or known. Once people start leaking information about their special characters, werevolves are faced with an arms race to come up with a more plausible story. Since sticking with the truth is much easier than coming up with a credible alternative, this often means inescapable death for the werewolves. The Little Girl. This character enables the player to peek during the werewolf phase. This means she can identify all werewolves at once, and then ask for protection from a healer or witch. A werewolf claiming to be the little girl first can, at best, delay his demise by one round – and even this rarely works, as most humans can tell the respective roles at this point. The Witch sees who is going to be killed. This makes the character even more powerful, as she can selectively protect known important characters, including herself, and knows for certain that someone she saved is human. In the first night, a player already dies. That means that there is one player who has no chance of defending themselves – and it is really boring if you are the one who drops out before the game has even really started. The add-ons only add more characters which just confuse the game and make everything more random. You might say, certain revealing moves could be banned from the game. But this creates the unfortunate situation where players get stronger the less strictly they limit the information they share. We tried a rule that forbids telling your character, but it ended up in people saying “Well, I'm reaaaallllyy sure those two are human” or “By the way, nobody dies next night” – same result. You simply cannot forbid conveying such information – it's not a clean game design in our opinion, and would only result in dissent about increasingly obscure ways around the rules. We have fixed these problems by separating factions and skills. A witch may now credibly demonstrate her skill – but that does not prove she is human. We have balanced the skills and introduced a brutal attack, so a clairvoyant is at a huge risk when revealed. This has produced interesting results, where clairvoyants would check their neighbours and, if they are safe, use them as a “clairvoyant proxy” – at the cost of dangerous communication. We have a lower character count – but that is not a bad thing if you like to make decisions and not rely on random luck. But – please play and see for yourself! We are committed to this project and have done our math. Unless our printing press goes bankrupt and there is not a single alternative with comparable prices, there's really not much to worry about. Should something unexpected happen, we might be forced to downgrade some components. We do not expect this though. Besides our utmost gratitude, you will receive a download link to the designed game material once it's finished (cards and game instructions in high resolution)! Also, your name or nickname will be listed in the digital version of the game instructions. All of the above + your name or nick will be immortalized in the printed game instructions! [This pledge is excluded from subsequent "All of the above"s] You want to support us, but you won't have enough players for TTOI - that's ok! This pledge will get you the T-Shirt only! All of the above + a copy of 'The Trials of Idavare' in a beautiful box, containing 55 cards, game instructions and a GM reference sheet! All of the above + either the werewolf mask used in the film or the T-Shirt! 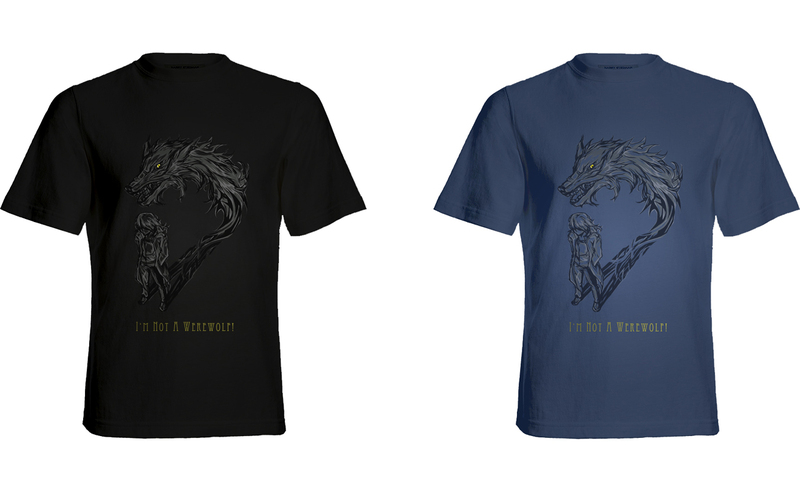 All of the above, but you will receive the werewolf mask used in the film AND the T-Shirt! All of the above + the marvelous limited black leather binding book 'Ars Versipellis'! All of the above + your "farmer alter ego" as a card in the released game! For this reward tier, we will require a picture of you and create a village farmer based on that picture. You may select your favourite quote from our quote pool to accompany your countenance. You will also receive an A4 poster of your farmer alter ego.